Senior citizens are joining the ranks of their younger counterparts and looking to technology to assist in improving their lives. According to a new survey, seniors are no longer technology skeptics, in particular when it comes to healthcare. In fact, an overwhelming number, roughly 70%, desire improved access to their healthcare and believe patient engagement technology is the way to get it. With goals such as more meaningful appointments, educational materials and more care plan options, seniors recognize the value of the right patient engagement tool. The most vexing of patient demographics, senior citizens present unique challenges such as a predisposition to chronic conditions, the need for multiple physicians and a real fear regarding the changes on the healthcare horizon. This research notes that although our elder population represents a small percentage of total patients, they account for some 34% of all healthcare costs. Fortunately, the obstacles respondents voiced in this survey, can be overcome in one solution. Get Real Health’s, Ellie care management product is just the answer for individuals looking for a collaborative approach to managing their health. For example, this research notes that the majority of seniors are dissatisfied with both the quality and frequency of doctor appointments and are desiring telehealth solutions. 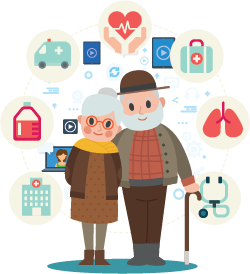 Ellie’s customized care plans and secure messaging allow for remote patient monitoring and immediate intervention should it become necessary. This window into a patient’s health outside of facility walls gives a measure of comfort to seniors and elevates the level of available practitioner care. Additionally, the wealth of educational content available through Ellie helps patients stay informed and updated between doctor’s appointments, a time saver on both ends of the stethoscope. This platform is so easy to use, even those not normally tech savvy will find great success. And with that success comes savings to patients, providers and the healthcare system overall with the added benefit of better health outcomes among this generation. To see all that Ellie has to offer, including opportunities for reimbursement for clinicians utilizing Ellie register for our upcoming webinar here. You may read the study in its entirety here.